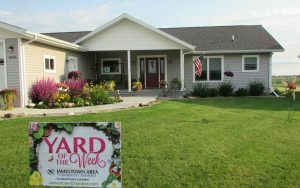 Chamber Release -The Chamber City Beautification Committee is pleased to announce the Week 6 winner of the Yard of the Week. Gene and Donna Sloan of 1604 10th Street SW in Jamestown, have received this award for Week Six. Their beautiful yard and the wonderful landscaping is a treat to view. They have put a lot of effort into their beautiful yard. Drive by and stop to congratulate them and thank them for their efforts to help beautify Jamestown. Congratulations, Gene and Donna for a job well done!